For the quinoa crust, you need 2 cups of cooked quinoa. The quinoa should be chilled so I made a batch a day ahead (whenever I cook quinoa, I wonder why I don't do it more regularly since it's so easy and quick). I make sure to rinse my quinoa thoroughly and I use a little less than 1 2/3 cup of water to 1 cup of quinoa and in about 15-20 minutes, I have fluffy quinoa ready to go. One cup of uncooked quinoa makes almost 4 cups cooked. Stir 1 beaten egg into the quinoa and season it with some salt and pepper. Then, just press the mixture into a lightly greased 9-inch pie plate. Bake for 20 minutes at 375 degrees. It won't be very brown at this point but will be dry and set. For the filling, I cooked up some onions, spinach, and mushrooms. I also added a couple slices of deli ham and a bit of grated parmesan cheese. For the custard, I decided to use 3 extra-large whole eggs (instead of 4 large ones per the recipe) and 2 large egg whites, along with half a cup of 1% milk. After about 35 minutes in the oven, the filling is set and the quinoa crust is nice and golden (plus, crunchy) along the rim. I was proud to pull this quiche out of the oven and happy to dig into it for lunch right after these pictures were snapped. The quinoa crust is sort of a quiet foundation for the flavorful filling. My husband and I really enjoyed it. We thought it looked rich but tasted so wonderfully light! This is intended to be divided into four portions, which is quite generous. The recipe from Cooking Light, which had feta cheese in it, clocked in at under 300 calories per generous serving. I'm not saying you need to count calories but I do think the stats are pretty impressive in this case. Here's to a great start to a New Year filled with good things! 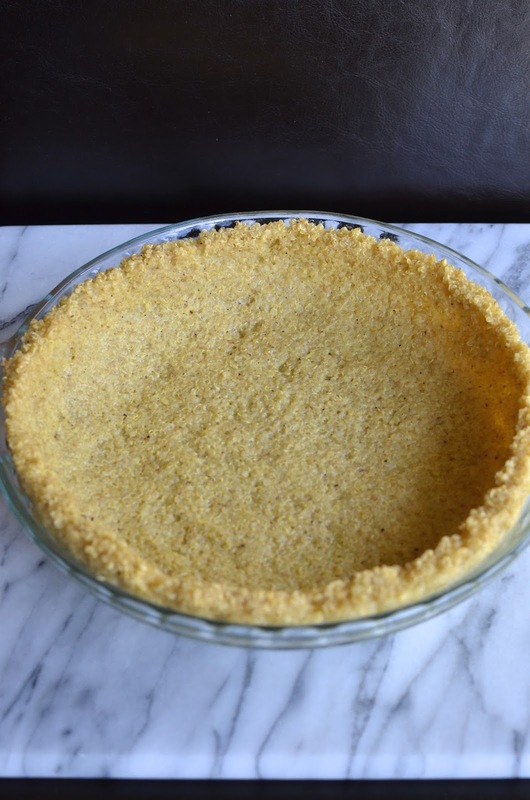 Make crust: Preheat oven to 375 degrees. Lightly spray a 9-inch pie plate with cooking spray. Season quinoa with some salt and pepper and stir in the egg using a fork. Press mixture into the bottom and up the sides of the pie plate. Bake for 20 minutes, then let cool. Make filling: Place oil and garlic into a nonstick skillet over medium heat. Add onion and cook for about 3 minutes. Add mushrooms and cook for about 3 minutes until mushrooms are tender. Add spinach, lightly season with some salt and pepper, and cook for another 2-3 minutes. Remove from the heat, discard garlic, and let cool. In a mixing bowl, whisk together the milk, 1/2 teaspoon salt, 1/4 teaspoon of black pepper as well as crushed red pepper flakes, the eggs, and half the parmesan cheese. Arrange the filling (omitting any liquid from the bottom of the pan) into the quinoa crust and scatter the ham around. Pour the egg mixture on top of the filling and sprinkle the remaining parmesan over top. Bake at 375 degrees for 35 minutes, until filling is set and the crust is golden brown. Let cool about 5 minutes before serving. Happy New Year to you too, Monica! This is a great savoury tart to start the year! That crust looks so good. Happy New Year, Angie. Thanks! Let's eat well and deliciously in 2015! Happy 2015! I love quiche but never seem to make it at home .... I need to change that! This sounds delicious - and that crust! Such a great idea! Wishing you a super 2015! I must try your quinoa crust idea. I am not one to diet either but just everything in moderation. Right back at 'ya! : ) Everything in moderation (including moderation?) is a good policy. Happy Happy New Year, Monica! So glad to hear your holiday was nice and relaxing! It's so nice when the husbands are home :) We have been enjoying it too! Love this spinach quiche! It looks absolutely delicious and I love that you used a quinoa crust! Love that idea! Yay for husbands! : ) I'm glad you're having a nice break, Kelly! Here's to a stellar 2015! Yes, lots of fabulous Qs here. : ) Happy New Year! This looks so amazing! I can't wait to try the quinoa crust! Monica, A VERY VERY HAPPY NEW YEAR to you and your family!! What a nice thing to say, yes, it's so nice to sit around and have meals. That's the best thing ever. The quiche is looking quite good, need to try it out. Thanks so much, Asha. Happy 2015 to you! Quiet life, good food, sitting down to have a meal and a good chat is THE best. I know you share my sentiments. I really must make this quiche and crust and with so many things like ham and turkey left over there is no shortage of quiche filling. Happy New Year! So, so true...great way to use leftovers, particularly all that holiday meat. Happy New Year! A quinoa crust for quiche is such a great idea. I can't wait to try it. Love how full of veggies your quiche is. This would make a great vegetarian meal! Totally could go vegetarian or not. Let's have a great 2015, Christin! I love the idea of a quinoa crust! This one's a must-try for me. And I think your philosophy about dieting is perfect too. I don't diet, but I try to eat healthily most of the time, and not be too hard on myself for the occasional overindulgence. Happy New Year! Yes, we're on the same page. : ) I try not to overthink it though it can be hard. Let's hope for more clarity, more positivity, and much more good food of *all* kinds in 2015! I am in love with this quinoa crust! Yum! It's pretty neat. Happy New Year to you, too! This looks lovely and a must try, Monica. I have always done quinoa crust with some added rice to make it crisp. Wishing you a wonderful 2015! You are so smart! I shouldn't be surprised you've done this with some rice...sounds awesome. And a fabulous 2015 to you also! Your quiche is beautiful and full of mushrooms which makes me a happy girl! Also that crust, you're a genius! Happy 2015 girl! I'm glad I spotted this genius idea from Cooking Light. Eating well has never been so "easy" and tasty. So many more options and ideas these days. A great 2015 to you also! I'm totallly NOT into dieting either!! Love this quiche! That is exactly my philosophy for January and the rest of the year too Monica. And even though salads are welcome, I couldn't begin my year without an indulgent cake. I love that you posted this delicious quiche. The quinoa crust sounds wonderful! I totally hear you and LOVE that you embrace cake. What would life be like without sweets - *not* sweet, that's what! haha. There's room for everything and I definitely make room for cake and sweets. Happy New Year Monica! I love the idea of using quinoa as a crust...the quiche looks delicious, indeed perfect for any meal. Happy New Year, Juliana! Thanks..and hope you eat very deliciously in 2015! love quiche and love quinoa. gotta try this one! it looks amazing. Thanks for that! It's definitely great for any quinoa-lovers. Happy New Year Monica!!! I hope it's amazing for you. This quiche certainly is! Here's to an amazing 2015 to you, too, Jessica! Amy - I'm so happy you took the time to stop by...it is so nice to hear from you. Hope 2015 is a very happy one for you and your family! I hope the little guy blossoms and you get a lot more sleep! ; ) I'm glad you might find this recipe useful! I didn't use very much cheese so it would totally be tasty w/o it at all! Yeah, I'm not feeling the 'extremes' either and so far, balance works better for me. The quinoa crust comes together so easily and beautifully...I was pleasantly surprised. This is just brilliant Monica!! This week's started to plan some new healthy meals for us all to enjoy and I need to add this one!! Delicious and so wholesome. Glad I had some quinoa in my grocery delivery this week 😀 Thank you for sharing and HNY! Yay - glad this is timely for you! I hope 2015 is starting off nicely for you - here's to a marvelous year!